To achieve a stable management and high profitability for cold regions upland farming, development of foods with high added value processed corresponding to new varieties, and those with new functionalities for demand expansion will be required. In collaboration with the breeding group and actual users, we are developing the processing and utilization technology of novel potato starch with an aim of maximizing ability in new varieties. We are also developing long-term storage technology of potatoes using ethylene. We are working on the development of basic technologies such as development of foods focusing on the functionality of resource crops such as buckwheat and Jerusalem artichoke, and evaluation of functional ingredients. 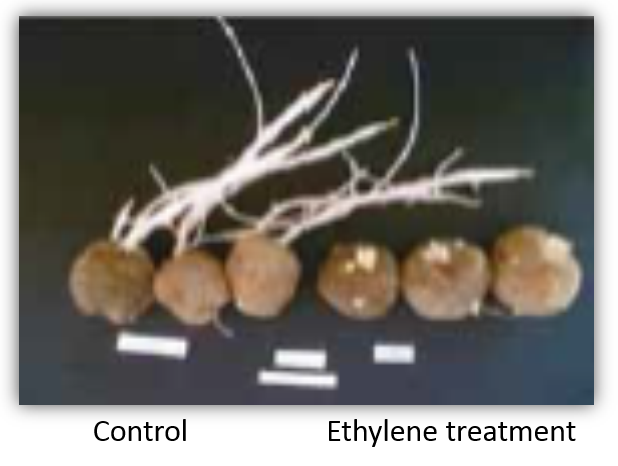 In collaboration with universities and private companies, we clarified the physiological mechanism of potato sprout suppression by ethylene, and have established the long-term storage technology of potatoes as high quality raw material for chips, especially after the mid winter season. This technology has been introduced to large-scale storage facilities of local agricultural cooperatives and food processing manufacturers, and contributes greatly to annual supply of processed raw materials. Also, with the aim of producing value-added potato starch, we evaluated that new variety "Pearl starch" which contains starch with low syneresis. By adding an aqueous solution containing a large amount of calcium ions to an ordinary high-phosphorus potato starch, we have developed a technology for the production of calcium-fortified potato starch with excellent viscosity stability. Ethylene treatment allows storage for seven months from the end of October.